In the spirit of Free Write Friday sponsored by Kellieelmore.com The prompt was given to use the “Pixar story-telling” formula. The prompts from the formula are highlighted in the story with italics. Once upon a time there was a young girl who was very shy and very quiet. Her world revolved around books. She loved stories of far away lands and adventures, her greatest treasures were old dusty books that were long forgotten in the oldest part of their towns only library. She would spend her free time dreaming of pirates, ships, islands lost in the ocean. Most of her class-mates thought she was odd, weird and would make fun of her. Some would tease her to the point of tears and she never seemed to fit in no matter how hard she tried. The only peace in her life she could find was tucked away in the dusty pages of Robert Louis Stevenson, Arthur Conan Doyle, Madeline Engle or Ray Bradbury. Here in her books, she was safe, she was happy. Here she could captain a fine clipper ship, ride a winged unicorn or solve the unsolvable mystery. The more that she was teased at school, the more she withdrew to her books and deep to her own writing. The more she was called a teacher’s pet, the better grades she made in school, yet still she was alone. Every day she would leave school feeling empty, making her way to her safe spot, the library to find a new adventure. An adventure that would take her away from that tiny little, backward town. The librarian, a kind, school teacher looking woman, would always greet her with a smile and a glass of lemon-aide. She would make her way to the furthest corner, of the darkest row, the dustiest back of the library, because that’s where the classics were. Her favorite book, Treasure Island was long since worn, and she knew it was because of her. Another book as she skimmed over it, she smiled, she knew she could tell you every line in it, Sherlock Holmes and the Hounds of the Baskerville. All of these books were old and no one ever picked them up, unless a teacher required them for reading. She felt a bond with these books, they weren’t wanted, just like her. Tossed to the side, gathering dust, forgotten, just like her. But if you opened them up, they were a treasure waiting to be found, maybe, perhaps, just like her. One day, she prepared for school happy and excited. Today, was a day she could shine, today was the practice for the spelling bee. She loved this teacher’s class, he inspired her to write, he took an interest in her quirky ways and recognized that she was smart. The spelling bee’s were a fun time for her because she was asked to speak and she loved to be able to talk, even though she was afraid to do so on her own in front of anyone. She had studied so hard, she was ready for her time to shine. She wore her favorite jeans and her unicorn t-shirt, it was her lucky t-shirt. Yes, the pretty girls always made fun of her when she wore it, but that didn’t matter, at least she would tell herself that. She could barely contain herself through her first two classes and nearly ran to English class, held in a small building outside of the main school. She wanted so bad to be first in line, and she was. Her favorite teacher greeted her with a smile as she put her homework on his desk. He stood up and ignoring all of the groans from the students that it was time to line up for the spelling bee practice. Now the young girl pounced like a cat with a smile on her face. Today, today would be her day to shine. She ignored the smirks and snotty comments from the popular kids as she took her place in line. “Today” she whispered “today, I’ll be a star.” Just then the door opened to the tiny modular and light beamed in almost blinding the young girl. It was the principle of the school, a giant of a man. His voice was kind but booming as he announced, “Excuse the interruption, however, we have a new student to join your class today”. The girl felt a lump in her throat, her thunder was stolen. She shuffled her feet, almost choking back tears. Then from behind the giant walked a boy, framed in sunlight. His eyes were like blue and gold sapphires and caught her eyes and held them. The tears turned to butterflies and she blushed. The teacher stood there and asked if this new boy wanted to take part in the spelling bee practice, even though he had not studied for it. He just shrugged and joined the line, beside the girl. The young girl was still lost in this young boy’s eyes. The competition started, quickly students sat down, relieved to be out of the test, until it was only two, the girl and the new kid. Now the girl felt threatened, yet slightly intrigued, there was someone to challenge her, but yet she thought, “Hey! This kid is smart!” The boy smiled a crooked grin when he was asked a word. That grin sealed it, the girl lost her mental balance and her spelling bee crown was passed to a new kid, of whom she didn’t even know his name. Because of that, the young girl slid into her desk feeling defeated. She failed at the one thing that she thought she could win at. Who was this kid? How dare he take this away from her! It was all she had, her books, this was her only class that she felt special in. Who was this kid? Why did he have to come here today? Yet that grin made her smile back. He didn’t dress fancy, he was quiet and he had this grin like a little devil mixed with angelic eyes. She wasn’t used to feeling butterflies in her stomach, in fact she wasn’t really sure what she was feeling, but every time he smiled, she smiled. She liked this kid, he was smart, but yet anything but perfect, and he wasn’t a snob or into sports. She was so happy when she discovered that he was also assigned to their advanced reading class. She loved listening to this new boy give his thoughts on stories they read, and he even listened to her read her poems written for the class. He listened like her teacher did, he looked at her when she read her stories and poems. Butterflies again, as she would blush. Even when he would tease her about “Unicorns? Again”. She didn’t cry instead, she would stick her tongue out and then blush. Now, kids can be cruel, sometimes more cruel than any adult can be. One spring day, a particularly cruel girl stole one of her poems and openly read it, making fun of her. It was a private poem, one about a princess with a crush on a prince. The mean girl teased and teased her until she could bear it no more and so she found a hiding place in her favorite teacher’s room, as he read to her from Edgar Allen Poe to cheer her up. Because of that, she sat unusually quiet during the advanced reading class. Here she was normally open with the other five students. This little group felt almost like family to her, but not today. She felt alone, separated from the world. All she wanted to do was escape to her dusty rows of books at the town library. When the teacher asked her to read her essay on a poem, she quietly responded, “I’ll never write out loud again.” Now the teacher knew what was going on and so he didn’t pressure her. She looked down at the floor, her heart was broken. The boy, looked at her, almost sad like, sympathetic to her pain, but she couldn’t look back at him. She could feel his sapphire eyes looking at her, through her, but she didn’t dare face him. Leaving class that day, changed her life, in ways that she wouldn’t know until decades later. She walked alone, broken, when all of a sudden she felt two arms grab her’s one on each side. And that new kid, and an old friend had come up from behind her, hooking their arms through hers and on cue, the new kid leading the other friend, loudly started singing the Dr. Pepper theme. They started skipping, very animated and weaving all over the gravel road to the main building, holding on tight to this young girl who was almost in tears, now fighting back the urge to break out laughing. This boy’s arm, tightly linked into hers, skipping, doing what he could to make her not hurt anymore. He teased her a little, but kindly and his eyes looked deep inside of her and touched her heart. She didn’t go to the library that day, she walked home, smiling, singing the Dr. Pepper jingle in her head, was she skipping? She was. She never skipped before, ever. The young girl felt something inside of her change. She sat down at her desk, in front of her Star Wars & unicorn posters and clipper ship models in bottles lining the wall. She closed her eyes and pictured that blue-eyed boy holding her arm, skipping away with her heart, and she wrote. And she wrote, and she wrote. She filled journals with stories and poetry, books piled up to the top of her closet. Every encounter she had with the boy throughout her high school years, she would write, he was her muse almost. She would watch him from across the street, she secretly had such a crush on him and it was more than a crush, she admired him, his freedom, his heart. Until finally, the boy took notice of the young girl, and for the first time he didn’t see her as just the sad little nerdy girl, who would smile back at him. One special day, he looked at her that way that she had always looked at him. He looked at her through his heart. It showed on his face and the young girl felt transformed. She looked back at him, his sapphire and gold eyes still beamed as they did that day of the spelling bee. His grin was still crooked with a slight touch of mischief. He took her hand and her heart skipped a beat. He looked in her eyes and she cried. He leaned in close to her and whispered into her ear, “No more fears”. That one sentence broke the spell of despair in her life. As magically as he appeared that day in grade school, and as magically as he appeared when she needed lifted up the most, he had appeared again. He reached out to her, pulling her closer and she could feel him give his heart to her, beating and giving her a new life. He kissed her softly and she felt every single dream she had ever had, come true. No more fear, nothing left to fear, life was complete, life was new. He took her by the hand and made her a promise that ever adventure that she dreamed of, read of alone in those dusty halls, she would now live, she would see the ocean, she would stand at the edge of the world, she would fly. She smiled and cried, finally the ugly duckling became the swan, and she began again to write out loud. Thank you Kellie very much for your kind words. I always appreciate your coments. Thank you very much, I’m always enjoy when my writings touch someon. 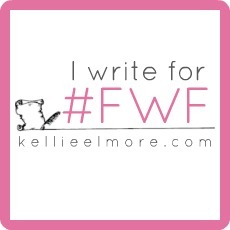 Awesome #FWF post. And that boy sounds like a cutie pie, lol! Thank you so much, and I would have to say he was and still very much so. I love stories of hope! I chose to believe there is always hope. Very nice job and great writing! Thank you so very much. Hope is always there, we just need to know where to find it and how to recognize it. Wow! A wonderful story, and I love the theme, “No More Fear”, because it is one of my favorites. Awesome write! Thank you so very much. When those words were spoken to me, my whole life changed.